They say one of the key ways to discover your true passion in life is to remember what you loved doing as a child. Emily Hart Lemoine doubled down on that advice. “I was the typical kid who loved animals, so being a veterinarian was always in the back of my mind. I also started running track really early,” Lemoine says. After a year at Oklahoma Baptist University, Lemoine became a Cowgirl. She transferred to Oklahoma State University, which offered a pre-veterinary curriculum and a Big 12 track team. Lemoine’s sprinter speed stood out in individual events, and landed her on the 4×100-relay team. She was again a winner, later in 2018, when she was selected to receive a Gentle Doctor scholarship at MU’s College of Veterinary Medicine. Lemoine graduated from Santa Fe High School, in the Oklahoma City suburb of Edmond, and enrolled at Oklahoma Baptist University. She majored in exercise science, but quickly figured out she did not enjoy it, and had little interest in pursuing human medicine. There was a big hurdle, however, to running down that dream at Oklahoma Baptist. “It is hard to get into vet school, and I didn’t think they would have all the help I would need,” Lemoine recalls. “So, I decided to transfer to Oklahoma State University, because they have a vet school and a great pre-veterinary program. I was very fortunate to be able to continue my running career there, as well. I was ready to give it up if I had to, if that’s what I needed to do to become a veterinarian, but I got to do both. She was as successful in the classroom at OSU as she was on the track. With graduation looming, Lemoine needed to decide on a veterinary program to get back on track with her veterinary aspirations. Lemoine says the CVM’s two-plus-two structure — two years of classroom instruction followed by two years of intensive clinical work — made a lot of sense to her. 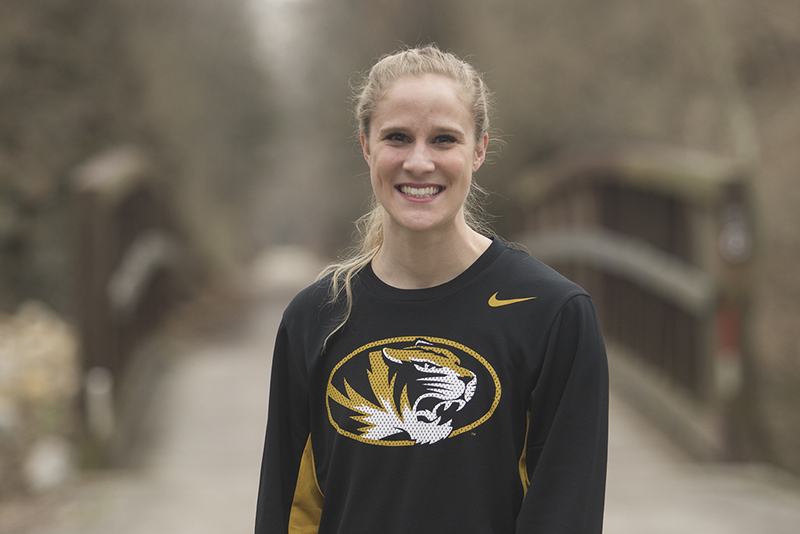 “Receiving the Gentle Doctor scholarship is additional reinforcement that I made the right choice to come to Mizzou,” Lemoine says. “It’s similar to how winning a race validates your ability and rewards the time, effort and dedication you put into it, and validation can be its own reward. “The financial support will have a big impact on my life,” Lemoine says. “It wasn’t easy for my family when my father died young. Now, I’m newly married, so the scholarship will be a big help during my time at the CVM and for years afterward. Libby Martin started job shadowing early. Growing up on a farm near California, Missouri, a small town about an hour southwest of Columbia, Martin has “very early memories of being on the farm, being around cattle, being all bundled up with tiny boots, bouncing around in the truck and watching grandpa feed the cows. As a first generation college student, at MU Martin majored in animal science with minors in business, entrepreneurship and agriculture leadership. That business interest and experience has come in handy. At recent Mizzou and UM System Entrepreneur Quest pitch competitions, Martin claimed first prize at both the university and system level, winning a total of $30,000 to advance work on an improved prototype to help cattle producers reduce calf mortality and increase profits. Her future is full of options. “I thought I knew what I wanted to do when I came here, and then you hear of all these other opportunities and it pivots the trajectory of your life,” Martin says. “I really love large animal-food animal medicine, so I would probably work out of a mixed practice. I don’t see myself doing just small animals. If the business keeps going well, maybe I’ll be the veterinarian of the company, if that is a stable career. I really like corporate medicine, so working for a food-animal company as their veterinarian would be interesting. Or, the government, the USDA or something like that. I always thought I’d own my own practice, but I think I’m looking for a bigger opportunity, to be involved on a larger scale, now that I’m actually in vet school and seeing all of the things that you can do. “Being at the College of Veterinary Medicine is really cool, seeing what you’ve worked so hard for actually come to fruition, in terms of, ‘This is what I’m going to be doing with the rest of my life, and what I’m learning is really applicable,’” Martin says. “There are a lot of extra things to do outside of the classroom, too, like getting involved in VBMA (Veterinary Business Management Association) and the Nave Veterinary Group, and that’s been fun to do that extra stuff outside of class, but within the vet school. A college education, not to mention studies at a graduate professional program, was not a guarantee. “In high school, I didn’t know if I was going to be able to come to college, because I was on my own, as far as paying for it,” Martin recalls. “In my junior year and throughout senior year, I started filling out a ridiculous amount of scholarship applications. I started working as soon as I was legally old enough to do that, and started saving money for college, because I knew my family would not be able to pay for it. That got me through undergrad. Then, I started that process over again my senior year of college, looking for scholarships for vet school, trying to figure out where to go. People always say, ‘Don’t expect to get anything,’ so I adopted that mentality, but my goal was still to put myself through school and minimize loans, so I applied. “I was shocked when I got the notification about the scholarship,” Martin says. “I was like, ‘They picked me?’ I was so humbled. The Gentle Doctor scholarship is not a small scholarship; it is substantial. It makes a huge dent, in the first year especially. Honestly, it made going to vet school feasible. It made it possible to go through with it. I was very thankful. “The CVM makes you feel so supported,” Martin continues. “For my business pitch at the entrepreneurship event, so many people from the vet school — professors, staff, classmates — were emailing me, wishing me good luck and even showing up for the pitch. I was actually crying when I looked out and saw that I had the biggest group of support there. I just felt really grateful.